We are used to thinking about prognosis in AL (light chain) #amyloidosis according to cardiac stage. 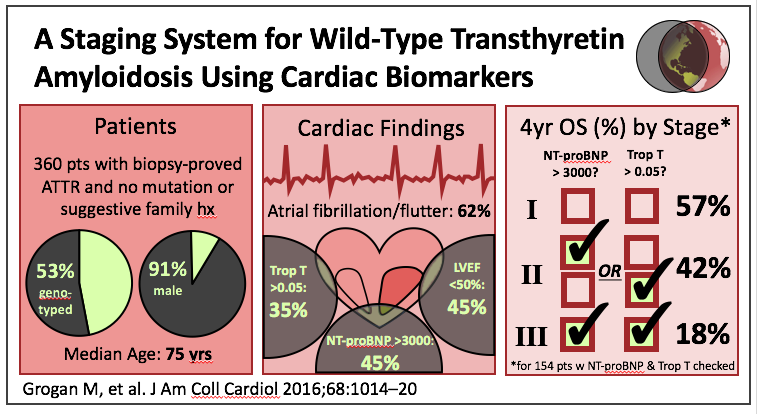 The original three-stage system which used NT-pro-BNP and Troponin T has given way to a four-stage system which also incorporates the difference between the involved and uninvolved free light chain (dFLC) in addition to the cardiac biomarkers used in the original system. Both systems clearly demonstrate the impact that cardiotoxic misfolded free light chains have on survival in AL. The natural history of ATTR (transthyretin) amyloidosis is less well-defined, in part because ATTR can occur as a result of a pathogenic mutation or in older patients without any identified mutation ("wild-type" ATTR, wtATTR). And not all mutations are created equally when it comes to prognosis. Food for thought, as we are preparing for the first #amyloidosisJC in a looooong time at 8 pm EST on Sunday February 25th. The article to be discussed will be another recent paper from colleagues at the UK National Amyloidosis Centre published in the European Heart Journal in 2017. Click HERE for a link to the article. We'll discuss the article, the Mayo paper, and the THAOS registry, amongst other things. Remember to use the #amyloidosisJC hashtag to join in on the conversation.